This book is the result of a NATO Advanced Research Workshop held in Vimeiro, Portugal, in May 1992. The objectives of this Workshop were: i) to promote exchange of knowledge between experts in various fields of discharge modeling, plasma diagnostics and microwave plasma applications; ii) to assess the state-of-the-art in this field from a multidisciplinary viewpoint; iii) to identify basic points needing clarification and to estab- lish basic guidelines for future research; iv) to compare the properties of microwave dis- charges to those of RF discharges, as plasma sources for specific applications. 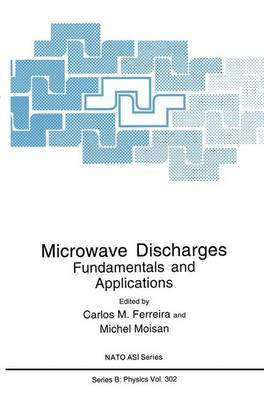 Most of the contributors to this book are well known scientists in the field of mi- crowave discharge sources, modeling, diagnostics and applications. The book provides an up-to-date review in this field which should be useful for both the fundamentalists and those using these systems in applications such as surface treatment and elemental analysis. We are gmteful to a number of organizations for providing the fmancial assistance that made the Workshop possible. Foremost is the NATO Scientific Affairs Division, which provided the major contribution for the Workshop. In addition, the following Por- tuguese sources made contributions: Instituto Nacional de Investiga~iio Cientifica, Junta Nacional de Investiga~iio Cientifica e Tecnologica, Centro de Electrodinamica da Univer- sidade Tecnica de Lisboa, Instituto Superior Tecnico, Banco Nacional Ultmmarino, and Regiiio de Turismo do Oeste.